I’ve reached the end of my series looking at how to use psychological models to build convincing characters with real dramatic potential. In this final blog, I wanted to mention a few which didn’t make the cut for various reasons, but which remind us firstly that there are several different ways to get a fix on your character, and secondly that there are a lot of models out there. This is more of a whistle stop tour than you’ve been used to from me, so you’ll need to do some further research on those you find interesting. 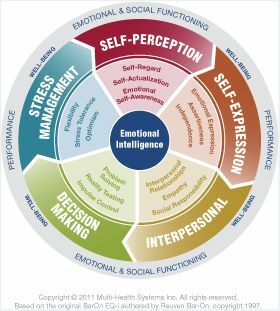 I think I deserve some kind of award for doing a whole series based on business psychology without using the buzzphrase “emotional intelligence”. Sadly, my winning run ends here, with a model that helps you think about how your character’s emotional literacy affects their interpersonal effectiveness. Writers are supposed to be masters of cause and effect, and this model is built around it. Start at the top of the wheel: the better I know myself and my emotions, the better I can express to others how I’m feeling, the better the quality of my interpersonal relationships, the more effective decisions I can make, the less stressed I am. If you were a management client of mine in my day job, that’s the virtuous circle I’d be helping you to build. Of course, in my other guise as a writer, the last thing I want is for my characters to develop world class emotional literacy. I want them to be so hideously un-self-aware that they express themselves clumsily, destroy relationships, make disastrous decisions and stress themselves to the limit. This model gives you lots of options to mess with your characters’ heads. Each component of the cycle in the diagram has three sub headings, and the full questionnaire would give you a rating on each. This is where it gets subtle. The EQ-i is great for looking at the contradictions that can hold a character back. Look under Self-perception: what if a character were to score high on Self-Actualisation (setting ambitious goals and wanting to achieve) but low on Self Regard (not believing themselves to be capable of achieving those goals)? Apart from thinking “hey, they sound like a writer”, you can see how just that one contradiction could give you a simple way into a character’s internal conflict. A quick example: Jo Gillespie (Sheridan Smith) in the current ITV series Black Work. She combines high Independence (the ability to act without referral to others, in theory a good thing) with low Impulse Control (she doesn’t think before charging off on a whim) – which, as a policewoman, is unlikely to help her stay out of trouble and turns her Independence score into a liability. This is already popular with many writers. I don’t use it in my own professional coaching work, but I hear it recommended regularly. Like temperament theory it has roots in models of personality going back over a thousand years. The advantage of using this model to build character is it helps you get round the danger of making your character such a recognisable type that they become a cliché. Here’s where the lines on the diagram come in. You start with the character’s basic type (choose your label from the nine on offer), but each type will be nuanced by traits of the type that sits to either side, and also by the types to which the lines connect them. For good measure, under stress they will appear like a warped version of a type that is opposite to them. A quick example: Sarah Travers (Cara Theobold) in the current BBC1 series The Syndicate. She is primarily a Helper (a servant who is also looking to be loved), with hints of Reformer and Achiever (she wants to do the right thing, as well as she can). The lines to Individualist and Challenger create a tension in her relationship with Sean – yes, she’s looking for love and security, but she can be suddenly and fiercely independent when crossed – and it’s Challenger which the Enneagram predicts is most likely to appear under stress, which gives her character its steely edge and stops her coming across as too good to be true. The Insights model draws on the same Jungian psychology as the Myers-Briggs, another model popular with writers (but, sadly, more complicated to describe in a few words). This is another useful model when you want to get a quick fix on a character. In the real world, sales people use it to develop a hypothesis about a potential client they’re meeting by focusing on, initially, a choice of four basic “energies”: Cool blue (detached, reflective and objective thinker); Earth Green (quiet, values and relationship driven); Fiery Red (action oriented, reality-driven) and Sunshine Yellow (radiant, friendly and enthusiastic). Allow for the possibility of crossover energies between these four and you get the wheel below, with eight energies. A quick example: Rust (Matthew McConaughey) in the first series of True Detective was an interesting example of an Earth Green, reminding us that “relationship oriented” for the introspective Green is very different from the outgoing, black slapping relationship orientation of the Sunshine Yellow. Rust is a dark, brooding, apparently isolated character, but his orientation towards personal values and authenticity in relationships was what brought him into conflict with his opposite in this model, the Fiery Red “Director” Martin Hart. 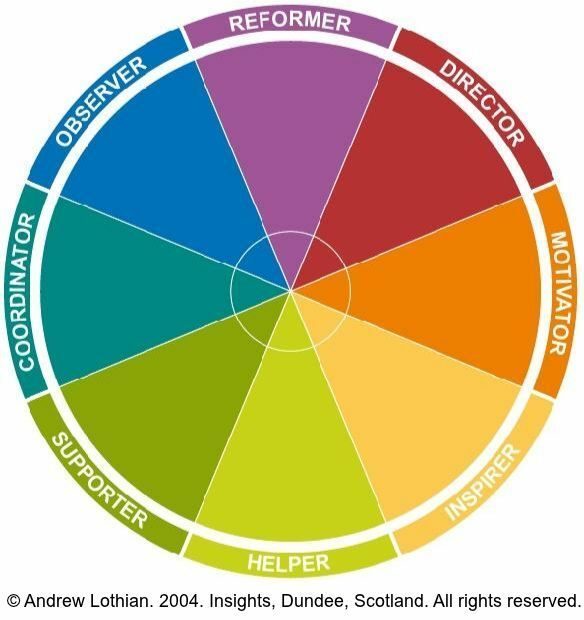 Rust at first glance might not seem to fit the label “Supporter” in the diagram, but that’s the danger of making assumptions about labels – in his own way, Rust will support someone whose integrity he trusts. So, the tour ends; and my head of Marketing reminds me to remind you to have a look back over my blogs in this series, and cherry pick those models which resonate most with you. Like the personalities in the models I’ve covered, as writers we are as distinctive as our characters, and your most authentic work will come from working with a model you feel at home with. There’s certainly no shortage of them. As always, approach with caution and please don’t psychoanalyse your friends, but if you’re working with fictional characters, anything that helps is fair game. This entry was posted in Character, Craft, Screenwriting and tagged characters, Phil Lowe, psychology. Bookmark the permalink.